Over the last decade, cities have increasingly embraced the crime-fighting potential of automated license plate reader technology. These camera systems are now ubiquitous at malls and train stations; they appear on street signs and perch on the dashboards of police cars. ALPRs can snap up thousands of geotagged photos per minute, and can help construct an incredibly detailed picture of a driver’s whereabouts over time. For law enforcement, ALPR represents a powerful tool that can track suspects in real time. Let’s say the police are pursuing a robber fleeing in a vehicle. They can add the suspect’s license plate to a “hot list” and receive alerts whenever an ALPR camera in their city snaps a picture of it. Using what’s essentially a real-time map, the police can track and intercept the suspect. But critics of the technology—including civil liberties and privacy groups—argue that license readers gather too much sensitive information about people who have nothing to do with crime, and it’s not always clear with whom it is being shared and to what end. This year, the Electronic Frontier Foundation, a digital rights organization, filed hundreds of Freedom of Information Act requests via Muckrock, a government transparency platform. The organization was looking for information on deals local and federal agencies have made with Vigilant Solutions, the largest private company selling ALPR technology and data. Recently, EFF released results from 200 responses. “We found a staggering amount of data that agencies are collecting on people—very little of which is of public interest,” said Dave Maass, senior investigative researcher at EFF. A total of 173 entities (largely police departments and sheriff’s offices, but also some federal agencies) in 23 states scanned a total of 2.5 billion license plates in 2016 and 2017. On average, 99.5 percent of scans belonged to cars that weren’t associated with crimes. This information was widely shared. EFF also found that, on average, each agency was directly sharing this information with 160 other jurisdictions at various levels of government. These could be police departments, university police units, airports, or Customs and Border Protection, for example. In addition, several agencies on the list also subscribed to Vigilant Solutions’ central database, which pools its own trove of ALPR data with that collected by various local agencies with which it has agreements, and sells access to this dataset to an undisclosed list of entities. What that means is even if your plates were shot in Georgia, your location data may be accessible to cops in say, Illinois. Or it may be bought by private companies or Immigration and Customs Enforcement. Although heavily redacted, records provided by the U.S. Forest Service suggest that the federal agency, too, shares information—with around 390 entities, according to EFF. Here is a map of all the agencies EFF has requested information on. You can click through to explore the map, or look up your local police department in the data here. So, if you’re a law-abiding motorist, how worried should you be about this technology—and what exactly should you be worried about? If hackers get a hold on what is essentially a geotagged map of your movements, they could sell that stalkers, robbers, or other individuals who wish you harm. Or, a large trove of that data for multiple people—law enforcement officials or political leaders, for example—could fall in the hands of foreign adversaries. Law enforcement officials seem convinced. But how effective is this tool? The “hit ratio”—the total number of “hot list” license plates detected per the total number of scans—is one useful metric. This number has been minuscule in past examinations—often less than 1 percent. In this new trove of data, too, EFF found that on average, the hit rate was 0.5 percent. In other words, law enforcement cast a very wide dragnet, for a very tiny catch of suspects. That itself raises a huge red flag about hot lists: Police departments have wide discretion in creating them, which may leave a lot of room for abuse. EFF has previously found that Vigilant has been incentivizing local police departments in Texas to focus on debt collection. Free Vigilant technology would alert police when people with pending court fines drive by. After they pulled the driver over, they could offer two choices: Go to jail, or pay the fine … plus a 25 percent “processing fee” that Vigilant largely pockets. In 2016, Buzzfeed found that Port Arthur’s sheriff used similar technology to shake down black and brown motorists who owed the city money. Remember that exploitative practice of squeezing the poor for municipal revenues that came to light after the Justice Department’s investigation of Ferguson, Missouri? These practices were high-tech variations on the same idea. Then, there’s also the fact that ordinary citizens with potentially nefarious motives can often obtain this license-tracker data through a public records requests in some places, or by having the police give it to them as favors or in exchange for bribes. They may then use it to target violence survivors, political organizers, journalists, or abortion-seekers. Police and other government agencies have a long track record of disproportionally surveilling populations of color, immigrants, and the poor, and ALPR offers another means of pursuing that practice. 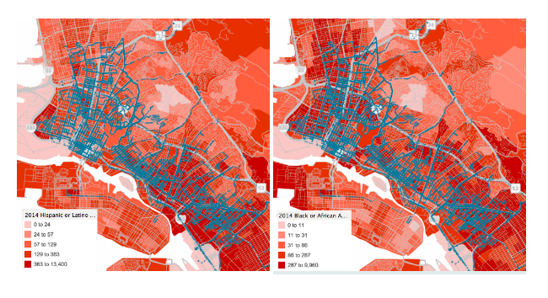 In 2015, EFF mapped how ALPR was used in Oakland. Police cars equipped with cameras would patrol low-income neighborhoods, snapping up more plates in these areas. That meant the residents of these neighborhoods were more likely to end up in the ALPR system—even though their neighborhoods weren’t necessarily correlated with higher crime. Surveillance tools like ALPR are often first used against vulnerable communities. But those who aren’t used to being singled out because of their skin color might want to remember that every driver on the road is fair game for this technology. To reduce the potential for abusing ALPR, advocates suggest purging the scans that do not generate a match on the hot list immediately, or at least after a few days. But underlying it all is the question: Should police have access to this kind of data at all?